Earlier this year, I bumped my wake-up time up by 45 minutes. I did this because I realized I needed to find more time in my life to do all the things I wanted to do, and since the day wasn’t about to sprout extra hours, I needed to recover them from somewhere. I thought it would be difficult, but since I am a morning person already, I adjusted to the early wake up time fairly well. Typically, if I don’t hit snooze too much, I am at my computer with my cereal and banana by 6AM, WERS on the radio. I give myself a half hour to eat and catch up on the internet. Then, it’s either time to write or go for a run. (I wrote about this a bit on my three-month blogaversary.) It’s worked out great. I can relax, get stuff done — writing or fitness — and usually still afford to walk to work (a 45-minute endeavor) if the weather is good. The advantage I had in starting this when I did, of course, is that in the spring, each day brings a minute or more of additional sunlight than the day before it. The dawn gets earlier, the sunset gets later, our days are increasingly enriched by daylight. By the equinox, we enjoy such an embarrassment of daylight riches that we barely notice as those minutes begin slipping away, until one day we’re standing at the bus stop after work, not too late, and we notice the sun almost dipping below the western horizon. Then we remember the hole in our pocket that let those minutes of sunlight slip away the whole time, unbeknownst to us. Lately, at 6:30AM, it’s still practically pitch dark — not exactly enticing weather to go out running around Somerville. So I’ve taken to running from my office after work, around 5PM. But after this weekend, when Daylight Saving Time ends, it’ll be pitch black at that time, too. But then, if my calculations are right, 6:30AM should be well lit enough to encourage me to step out of doors for running again. What a yo-yo. Then there’s the writing. Lately, work has picked up, and I’ve been doing more e-mail-checking and task-completion here at the home office. I am trying to sanctify this early morning time, but it’s easy to see it as a great time to knock items off the ol’ to-do list. And that’s an even more tempting diversion when you’re at a crossroads with your main project, unsure how to proceed. So, what does all of this mean? It means that no matter how you schedule your life or attempt to reclaim your time, forces outside of your control — be they astronomical or mundane — will intervene. No matter what plan you put into place, you have to be willing to adjust if you’re still committed to your goals. And if your goals seem insurmountable, you’ve just got to find some way of chipping away at them, in whatever space you can find to do so. Here in these early hours, it’s easy to become pensive. I’m awake a long while before my husband and many of my friends, and the world around me is dark and still, so it’s a very solitary time. I hate overhead light, so I prefer to sit in the dark by the glow of the monitor until the natural light begins to filter through my window, gradually illuminating my space. But if there is one abiding advantage of waking up this early, it is regularly seeing the sunrise out my kitchen window. The picture above was taken this morning. Sure, it ain’t over the Atlantic Ocean, but for a view from Winter Hill, it’s not too shabby at all. And while the amount of time we get to see it each day is ever-changing, the sun always comes. Everything else may change, but you can always can count on that. Who Are These People and Why Are They Running for Senate? So, I have a question about this wacky Senate race we get to have in Massachusetts. Everyone says Martha Coakley is the frontrunner over Mike Capuano. (I’m not even taking Khazei and Pagliuca seriously.) But… why? I’ve only seen one independent poll give her a lead, but that was a month ago. (A more recent, but still several weeks old poll commissioned by Coakley’s campaign also gives her a big lead, as does an unscientific poll at kennedyseat.com.) I’m wondering how much of this is actual data versus expectation. Anyone have any supplemental information? Here’s the problem I’m having with this campaign. It’s hard for me to find any comparative information between the two leading Democratic candidates. Boston.com is letting me down bigtime, and KennedySeat.com, while promising, still seems incomplete. I’m familiar with Capuano because I live in Somerville and he’s my Congressman, but if he’s been harboring these big-time ambitions for a while, he did himself a disservice by not getting some name recognition outside of his district. People don’t know who he is. (Heck, I’ve at least heard of Barney Frank and William Delahunt and — when he was still in Congress — Marty Meehan.) Capuano’s been off in D.C. — doing great work, in my opinion — while Coakley has had the benefit of being in Massachusetts and having her name come up fairly often. So I guess I understand why she is considered the frontrunner, data or not. But that’s not enough for me. I have nothing against Martha Coakley, and I think most of her views are in line with mine, but I need more information. I’m really looking forward to the debates to begin to see what the ideological differences are between these two candidates. The first debate is Monday night at 7PM and will be aired on NECN. I’ll be at pilates class, unfortunately, but I can’t wait to read/watch the recaps and catch future debates down the road. Interestingly, I follow both Capuano and Coakley on Twitter. The Capuano team is much more savvy with how to use the tool, getting in touch with the liberal community on Twitter, retweeting and (sparingly) responding to followers. Coakley is doing the same, though I think to a lesser degree, but here’s what really bothered me. I went to her website to read up on her positions, and there was no information on anything remotely international: Afghanistan, Iraq, national security, terrorism, North Korea, you name it. I was a little appalled. I understand she’s been working at the state level, but if you’re running for a Senate seat, you cook up some views on international affairs and let them be known. (The only statement I could find from Coakley on Afghanistan, in an interview with NECN’s Jim Braude, was pretty unsatisfying.) So I sent a message to her via her Twitter account — both a direct message and an @ reply — inquiring about statements of her views on international affairs. No response. For that, she gets docked a couple of points in my book — if you’re going to be in the space, you can’t just be broadcasting. You have to be listening. Because people will talk to you. And if you don’t answer, it’ll leave a sour taste in their mouth. Those are just my initial observations on what is sure to be a long and annoying race. 🙂 More to come on this topic, I’m sure! The only thing I knew about yesterday is where I would begin. I had no idea where I would end up. Lately, I’ve had a bit of wanderlust combined with an urge to drive. I’ve been missing the open road, which I gained a fine appreciation for while road-tripping around the South with my brother this summer. So I took a day off of work, booked a Zipcar, and set out from Somerville with only a loose set of destinations in mind. After breakfast with a friend in Peabody, I hit Brooksby Farm to get some cider donuts. I had been told that my New England citizenship was in danger of being revoked since I had never had one, and sure enough, they are good enough that it is a crime I hadn’t had one earlier. From there, I found my way onto 127, headed toward Gloucester and Rockport. I’ve been to those towns before, so I wasn’t particularly interested in getting out of my car and exploring the towns. I was more interested in seeing what would happen behind the wheel. At several points, I lost track of where I was. But I didn’t really care. As long as I was on a main road (or something resembling a main road), even if I hadn’t seen a 127 sign in miles, I was OK. I pulled into a random park at one point that had a stunning harbor view. Turns out it was Stage Fort Park, where Tablet Rock designates the first settlement of the Massachusetts Bay Colony at that spot in 1623. I drove past Good Harbor Beach, taking in dazzling views of the beach, the ocean and the rocky shoreline — at one point, I pulled into the Elks parking lot just to sit back and take it in. I drove past the Fisherman’s Monument, downtown Gloucester and all the little shops and homes. I continued through Rockport, stumbling into the kitschy, narrow lanes of Bearskin Neck. I continued down 127, hooking back west until I reconnected with 128. By this time, I had my fill of quiet scenery and was ready for some acceleration. I proceeded to cut over onto 133 to hit Woodman’s in Essex for the last crab roll (my weakness) of the season. So tasty — and relatively empty. I can’t imagine that place in July. With nothing else on my agenda, I decided that a couple of hours of driving and singing sounded pretty good. So I got on 93-North and decided to drive to Derry, New Hampshire, with the iPod tuned to my Favorites playlist. In truth, I just wanted to cross state lines — it sounds like a silly wish, but for someone who doesn’t have a car, it is kind of a rare treat. Luckily, in New England, if you have a car (or, heck, even a commuter rail ticket) it’s easy enough to do. I had a loose goal of finding Robert Frost’s farm, but with no clear directions and time running out on my Zipcar reservation, I didn’t look too hard. After I made it back to Somerville and dropped off my car, I headed downtown for Boston Blogtoberfest. I’m trying to hit more of these events (call it a fall resolution). I saw Brad, finally met Steve Garfield and the Whalehead King and chatted with some new folks like Jaclyn the Bar Warrior. It was a good time, though I haven’t checked my credit card yet to see how much that gin and tonic cost me. Around 8PM, though, I got the itch. Not that the company and conversation wasn’t good, but I realized that it was unseasonably warm outside, and I had nothing but time and a city at my disposal. I proceeded to take a rambling walk up Berkeley Street to Marlborough Street, walking up to the Common, past Cheers, around Beacon Hill, past Louisburg Square (and John Kerry’s brownstone) and ultimately, to the street I lived on when I was a baby. That’s right, the first two years of my life were spent in one of Boston’s toniest neighborhoods. Eventually, I reached 36 So. Russell Street, at which point I called my mom to chat. It was weird, but pretty awesome. I then headed to Charles/MGH, where I boarded a train for Davis Square and headed home. I hated to turn away from the balmy night air, but the need to rest overruled my urge to explore. It had been a day spent immersed in the poles of the New England experience, from Bearskin Neck to Beacon Hill, from sitting behind the wheel to hitting the pavement. Notably, while I loved driving around Massachusetts, taking in the foliage and the ocean views, the landmark sites and the interesting roadside scenes, my favorite moment of the day was when I was walking to Blogtoberfest, on Tremont Street where it crosses over the Mass Pike. The sun had set, but there was still a splash of light on the western horizon. The Pru and the Hancock tower were lit up against a deep blue dusk, and the rush of traffic below soundtracked the scene perfectly. The day had given me an appreciation for New England, affirming it as the place where I belong. But right then, between the highway, the sunset, the city lights and the tens of thousands of people around me, I felt the most at home. Why Would Anyone Move to the Suburbs? That’s what I said Saturday night when I was with a friend in Davis Square, watching Emperor Norton’s Stationary Marching Band (left) playing HONK! Fest. I went to HONK! for the first time last year and was captivated not only by the eclectic collection of musicians that take residence in Somerville for the weekend but by the spirit of irreverence and celebration they bring to the city. Stiltwalkers mingle down Elm Street with college kids and hipsters. Bowler hats and band uniforms rival Sox caps and North Face fleeces. They take up residence on sidewalks and in plazas by day, crash on our couches by night. Walking around in Davis Square Saturday night was like wandering into a delicious blend of Carnevale and high school band practice. A flamboyantly geeky and political music explosion. I know some people move to the suburbs because they want to be able to afford a nice home with a yard, or they want a quieter, safer place to raise a kid. But honestly? 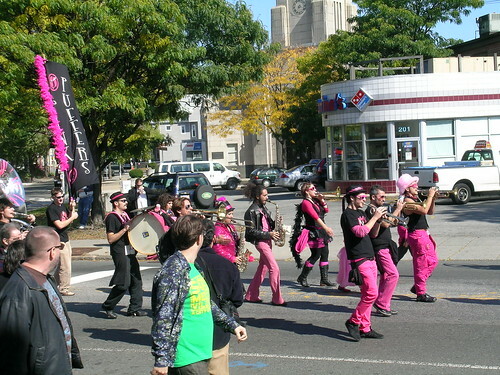 I don’t mind raising my kid with a little ruckus, in a smaller house, if it means being exposed to events like HONK!, What The Fluff?, Artbeat and Somerville’s many other offbeat cultural offerings. Not that there aren’t cool events and experiences in the suburbs, but I think I particularly value the weirdness of what Somerville offers. I also like the idea of raising my kid(s) with a healthy appreciation for the odd and off-kilter. 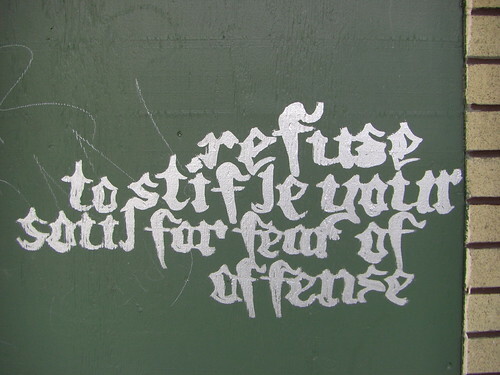 A little street sense can’t hurt either. The other day, The Spotted Duck posted about a last fling with her neighborhood of Coolidge Corner, which it seems she is moving away from in the near future. Coolidge Corner is one of the most fun, lively neighborhoods in the Boston area, and it’s only as I’m leaving that I find myself really appreciating it…. But for us, it’s time to grow up and move on. Time to buy. Time to exchange location for space. Delicious space. Wonderful space. Still. I’m going to miss it. I guess that as we get older, we all make calculations and trade-offs. Our priorities shift. Practical concerns may necessitate a change. So, for me? Space is great, but location and experience mean so much more. And I don’t want to become one of those people who gets all worked up about “coming into town.” Am I being naive? Idealistic? Maybe. But I also don’t want to settle for something less than satisfactory. This isn’t just my life I’m talking about. If we can (and of course, the markets may conspire against us), we’d love to be able to stay in Somerville or somewhere nearby, start a family and raise a little weirdo or two. Maybe, Rick and I joked, one of them will march in some installment of HONK! 15 or so years down the road, hula-hooping while playing the trumpet and waving proudly to us as we stand along the route — just down the street from our house. Given recent “tweckling” (twitter heckling) during talks, what do you think the new geek rules of audience etiquette ought to be? One incident this question most definitely references it the Great Keynote Meltdown of 2009. In short, the second keynoter (#notjared) at this year’s HighEdWeb conference in Milwaukee, David Galper of Ruckus Networks, took to the stage with an outdated message, an outmoded presentation and an outstandingly poor understanding of his audience. Thus, the conference back-channel (#) took over (read from 11:59PM on), skewering Galpert mercilessly. I wasn’t there this year, but you can read a good recap (which links to other good recaps) over at .eduGuru. I totally agree with people like Fienen over at .eduGuru, who wrote, “[Higher ed web professionals’] tolerance is high, and our expectations are such that not meeting them really means you’ve failed completely. … It’s refreshing being able to be truthful with people that understand you, because we were all pretty equally disappointed.” I have no qualms with how HighEdWeb attendees felt about David Galper’s keynote. Following along via Twitter, I was sympathetic (and highly amused). If I had been there, I would have been joining right in. All sessions must obey the Law of 2 Feet – if you’re not getting what you want out of the session, you can and should walk out and do something else. It’s not like you have to get your money’s worth! Podcamps offer a nice alternative — not a replacement for traditional conferences, but a complement — that allow the attendees to really run the show, both in terms of which sessions are held and which are actually populated. At an organized conference, you probably feel a greater obligation to stick to the script and not rock the boat, which is understandable. You (or your institution) are paying hundreds of dollars to register, send, house and feed you for the duration of the conference. And while anyone can submit a proposal for a conference session, it is still subject to approval. Let’s go back to the #heweb09 back-channel. In retrospect, was there any way to turn that into a “front-channel,” to mobilize wide-scale dissatisfaction into something productive? If someone had tweeted, “Hey guys, I’m going to do a presentation about _______ in the lobby for the next half hour, starting in 5 mins. Join me if you want,” would anyone have followed? Or what about interrupting the keynoter, raising a hand in the middle and interjecting with a couple of well-meaning observations? Would that have been construed as rude? And if so, by whom? Where does rudeness begin, really — with a presenter who obviously did no homework about his audience and thus disrespected their intellect, or with the subsequent “tweckling” of the presenter on a forum where he could not defend himself? Why was this the case? Were people caught up in (or paralyzed by) conference etiquette, safely venting their frustrations on Twitter while the train wreck carried on before them? If HighEdWeb had an expressed Law of 2 Feet, would things have been different? I don’t say any of this to judge or criticize HighEdWeb attendees (generally awesome people) or organizers (awesome AND hardworking people) — it’s an amazing conference, and I hope to heck I’ll be there in Cincinnati next year. But this whole episode just made me think about conference etiquette — and I definitely have more questions than answers about it. What are the rules of engagement in that context? Can conferences learn a thing or two from unconferences? Does higher ed need an unconference? We fault the speaker for failing at his responsibility to us, the knowledgeable audience, but what is our responsibility to him? How can we rescue wasted time, or turn something crappy into something marginally useful? Speaking of the speaker, I can’t help but wonder if David Galper has any idea what havoc he wreaked on the higher ed web community. Probably not, since he’s not on Twitter. Will he learn the error of his ways? Hard to say. It looks like the windows of opportunity for that to happen are few. Chris Brogan linked to a post by his “Trust Agents” partner-in-crime Julien Smith about becoming child-like. In the post, he writes that the more we retain the adaptability and curiosity we are born into the world with, the better for both our business dealings and our day-to-day lives. I agree with this wholeheartedly. These traits, along with wonderment, sincerity and idealism, are sometimes considered “childlike” but, in my mind, retaining a healthy sense of each of these open our eyes to more of what the world has to offer — and more of what we can offer it. But mistakes are the stuff of life– it’s how we learned not to touch the burner on the hot stove. …there’s a real problem with the way we’re brought up. We learn by making mistakes, but those mistakes also teach us to fear a lot more than we need to. We need to find ways to absorb the idea that the worst will usually not (or never) happen. How can we do this? I completely agree with what Smith says here about the need to make mistakes — it’s the only way we learn, whether it’s getting an answer wrong on the math test or scrubbing a project because it’s not working out as planned. Failing forward — I’m all about it. But what got me is this sentence: “We learn by making mistakes, but those mistakes also teach us to fear a lot more than we need to.” I don’t think it’s making a mistake that necessarily makes us afraid — and I think this is an important clarification to make — it’s people’s reactions to our mistakes that make us afraid. If I screw something up, how I feel about it will largely depend on how other people feel about it. If my boss freaks out and yells at me, I’m going to feel a lot worse — and a lot more gunshy the next time — than if my mistake is met with understanding and a constructive conversation about how to learn from it and move on. That’s not to say that all mistakes should receive some sort of a passive reaction — you wouldn’t just sit back and let a child touch the burner on the hot stove and then chat with them about it afterward. But the reaction can be firm, if necessary, while not being discouraging. More often than not, fear is bred from an expectation of the consequences of doing wrong. But what if we stop treating mistakes as something done wrong? A mistake is simply one of the possible consequences of trying. The more we can make mistakes into learning opportunities rather than opportunities for recrimination, the more we can re-channel fear into motivation. So, how do we do this? It’s easier said than done. We can’t always choose our bosses. We can’t control how people react to what we do or don’t do. But to the best of our ability, we can seek nurturing environments. We can encourage cultures that are supportive, not reactive. We can set an example and hope for the best. We can steel ourselves against those who try to bring us down for our mistakes with the knowledge that we will learn and do better work next time. It is not ideal, but we can do something to counter the fear and turn mistakes into opportunities. One last point: Smith also says that human beings are “naturally submissive.” I’m not sure how much I buy this. Going back to the crux of Smith’s post — the point that we need to regain a childlike sense of adaptability and curiosity — what about a childlike sense of fearlessness? Where there is fearlessness, there is entrepreneurship, experimentation, free thinking and speaking. Perhaps that is another childlike quality we should try to hold onto. 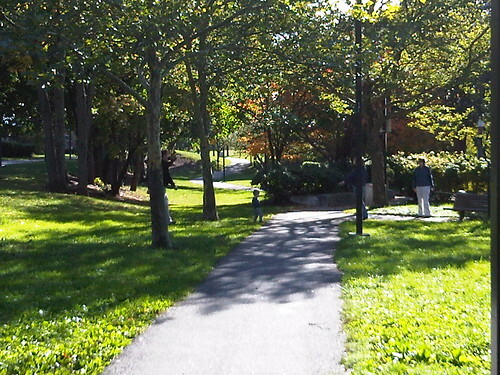 In my earlier post about walking to Dorchester, I mentioned a garden area behind Mass. Ave station. My friend Alison responded that that green space is part of the Southwest Corridor, an unassuming name for a space that I found to be uniquely compelling when I walked the length of it yesterday. The weather was odd — sun and clouds, with an occasionally stiff breeze — but it was still possibly the Last Warm Day before autumn tightens its grip. 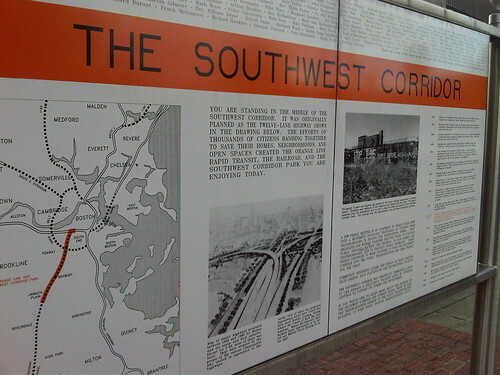 I didn’t know much of the history behind the Southwest Corridor when I started my trek, but luckily there is plentiful signage along the way that tells the story. Running along the length of the Orange Line between Back Bay and Forest Hill stations, the land was originally acquired and cleared in the 1950s and 1960s to make way for a new multi-lane extension of I-95. After residents rallied against the highway, the land languished until the community began mobilizing to turn it into preserved parkland. The resultant Southwest Corridor combines park resources (tennis/basketball courts, etc.) and green spaces/community gardens with walking/biking paths and a transportation conduit. It’s about 4.7 miles in length and not particularly wide, but it cuts right through the heart of the city and gives you a great urban perspective. The most interesting thing about the Southwest Corridor, for me, is how it is such a good example (for better or for worse) of urban evolution. It was originally the location of Stony Brook, a main water conduit for industry in the area. It then became the elevated Orange Linesite of the New York and New Haven train line, and was then intended to become a highway before the community rallied against that. Then it was reclaimed by the community as a green space, closely tethered in purpose to the transit system it runs alongside. It also showcases a lot of vestigial features of the city, like the leftover Green Line signage and tracks at Forest Hills from the long-“postponed” E line. It’s a living history lesson. All of the public art (EDIT: more about the art) and signage lining the path only enhance that. It was a delightfully Boston day. Not only did I see some new parts of the city, but I even saw the Tricycle Guy and ate lunch at Doyle’s Cafe. On that note, this walk reminded me of two things. One: I am long overdue for a thorough jaunt around the South End. Two: I need to spend much more time south of the river. I am missing out on a lot, and there is a lot left for me to discover. Check out all of my photos on Flickr.